Having seen a few snippets of The Room (2003) via reactionary and review videos, I have become somewhat familiar with how bad the film is without having to sit through all of it. 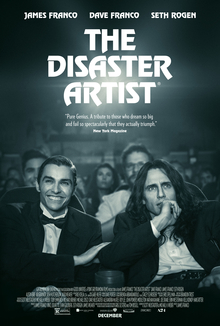 In The Disaster Artist (2017), we get to see what led to this “worst movie ever made.” There’s a lot of lore and memes that have come out of The Room over the years, but the simple fact of the matter is that most serious Hollywood types probably couldn’t create a movie this bad if they had tried (and many certainly do so unwittingly every year). While James Franco is almost eerily on-point of his portrayal of director/writer/actor Johnny Wiseau, the recreation of specific scenes and setups from The Room isn’t nearly as impressive as I think the makers of The Disaster Artist realize. The side-to-side comparison during the credits was startling in the amount of accuracy, but it’s also not too challenging to recreate a film that seemed to be put together by amateurs in the first place. And perhaps that’s part of the charm: The Disaster Artist shows how, given the ambition (and an almost endless amount of money), anyone can make a movie. In the end, I think The Disaster Artist works on the concept of schadenfreude. Those moments where the audience plainly sees that things aren’t going as planned or that the characters are making poor decisions are somewhat fun to watch since they aren’t happening to the audience. However, there’s an amount of cringe that goes into these kinds of comedies, which is sure to set some people off. The comedy isn’t in actual jokes or amusing situations, but rather in watching a train-wreck and being unable to turn away from it. An adequate movie about making the absolute worst movie, I give The Disaster Artist 3.5 stars out of 5.